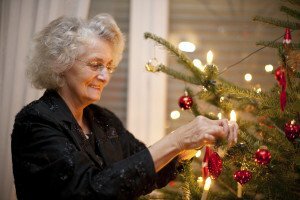 For seniors with a lifetime of holiday memories, this time of year can bring about feelings of warm nostalgia, but can also trigger more negative emotions. Loss of loved ones and times gone by, stressful changes to routine, and perhaps confusion and anxiety if there are underlying physical, mental or emotional conditions at play can all lead to a full-blown case of the holiday blues. Stroll down memory lane. Older people whose memories are impaired may have difficulty remembering recent events, but they are often able to share stories and observations from the past. Use picture albums, family videos and music, even theme songs from old radio or TV programs to help stimulate memories and encourage older seniors to share their stories and experiences. Get out of the house. In addition to memories, seniors need new things to anticipate. Enjoy activities that are free, such as taking a drive to look at holiday decorations, or window-shopping at the mall or along a festive downtown street. Be inclusive in meal preparation. Involve everyone in holiday meal preparation, breaking down tasks to include the youngest and oldest family members. Reach out. Social connectedness is especially important at holiday times. Spend quality time with senior family members and make it easier for them to be social by purchasing food they can have on-hand to entertain without stress when folks stop by, such as nuts, dried fruit, and an assortment of teas and cookies in tins. Monitor medications and alcohol. Be sure to help older family members adhere to their regular schedules of medications during the frenzy of the holidays. Also, pay attention to alcohol consumption during holiday parties and family gatherings, as alcohol can interfere with medications. Keep in mind that we’re also here to help seniors stay active and engaged throughout the holiday season and beyond! We love providing transportation and accompaniment for seniors to get out and enjoy the world around them, whether an evening drive to look at holiday lights, an afternoon of window shopping, a trip to a holiday play or movie, or a visit with family and friends. And for homebound seniors, we can bring the joy to them, spending companionable time reminiscing about the good old days, creating holiday crafts, decorating the home – whatever sparks some interest and provides a smile. Contact our professional California home care team today at 866-940-4343 and ensure a happier holiday season for your senior loved ones!